..and the blog post tile I’ve chosen here is just linkbait. You can go ahead and use the ideas in this post for your next journal paper submission, but chances are it will be rejected. But catchy titles mean something. It’s why in the era of fake news, we click on things that seem unbelievable or which we don’t think could be true, just to find out we’ve been tricked and we’ve not. 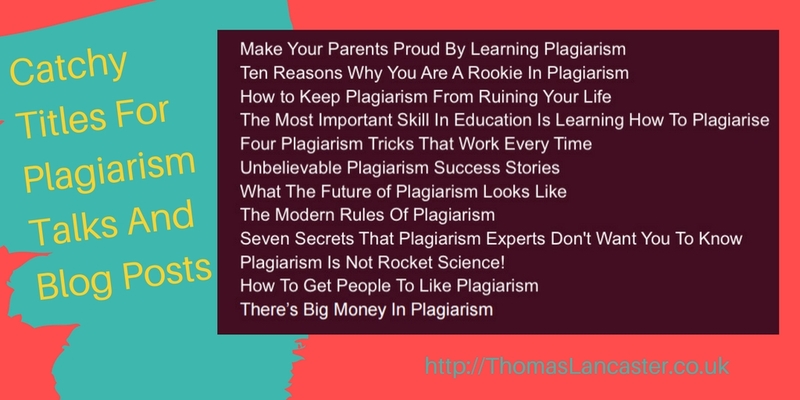 I shared a set of catchy titles relating to plagiarism and several people asked how I generated them. My favourite title is the first one, which is aimed at getting students interested. And, I can so easily imagine someone running with just that title (but hopefully not delivering on the promise). A lot of it is about turning plagiarism on its head from what students expect. You could use almost all of those titles, with slight modifications, to talk about other subjects. Many work for academic integrity just as well as plagiarism. But it doesn’t have quite the same ring to it, does it? “There’s Big Money In Academic Integrity” might do better. But, the fact is, most of these titles are generated from templates. If you look at what’s trending on a site like Buzzfeed, you’ll see the same patterns appearing in titles again and again. And, so many of them have a number in the title somewhere. You can base your own title on that and you’re already well-positioned to get attention. You can go one-step further. Many of the titles that work most cleanly across different subjects (or niches) have been developed into title generators. You just plug your subject in there and watch the generator spit out a whole load of titles until you see one you like (or one you like enough to modify a bit). My experience is, you’re not likely to get anything exactly perfect from a title generator, but it’s pretty easy to take something they make, change it up and tidy the grammar. If you get more advanced, you can start using headline analysis as well to work out the emotional impact of your title. But that’s a more advanced marketing technique, particularly for academic work. And, if you don’t want to use these titles for your next academic paper, that’s fine. You can always use them for the blog post to promote the paper instead.